The Zendure SuperTank is the best battery pack we've ever used. Between the feature set, quality, and the choice and speed of outputs, SuperTank is hands down the unquestionable winner of portable batteries. Zendure has just announced a litany of new products, all designed to complement one another. 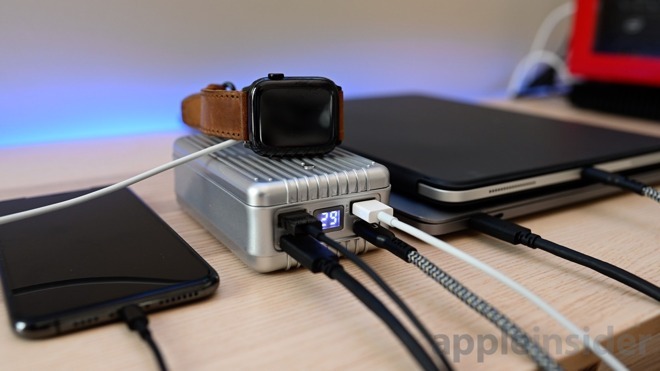 That includes the powerful SuperTank battery pack, the SuperPort 4 multi-charger, and of the course the SuperCord to connect it all together. There are two separate products to look at. While the SuperTank is the most headline-grabbing item, SuperPort 4 should not be overlooked and can easily stand on its own. If we focus on SuperTank, it is a massive 27,000mAh battery pack with four USB outputs. The capacity is the maximum allowed by TSA without requiring pre-authorization to bring on a flight, which already makes it a great travel companion. Of the outputs, there are two USB-C ports and two USB-A ports for a total of four simultaneous outputs. One of the USB-A ports is 15W, the other USB-A is 18W. Of the USB-C, one is 60W with Power Delivery and the other is 100W with Power Delivery. When used at the same time, it is capable of 138W of power output between all four ports. When it comes to input, the 100W USB-C PD port also acts as the input. That means while charging the battery, you can only connect three other accessories. This has its perks and drawback, which we will get into. Instead of going for an elongated design like other big names in the industry, Zendure prefers a more compact shape. This makes it easy for the battery to stand up on nearly any side for easy access to the ports. Depending on which finish you choose, it has a silver or black exterior that is very similar to popular luggage designs that holds up extremely well over time. We know that because this isn't Zendure's first giant battery, it is simply the latest. 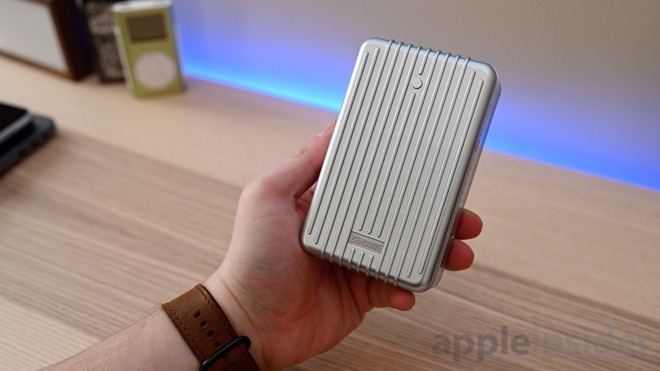 The A8PD has been on the market for a while and has a 30W USB-C output with a similar design. Just like that model, the SuperTank offers a display which gives you easy gauging of the battery's remaining capacity. On the top is also a small button used to turn on the battery, as well as changing the modes. With 27,000mAh capacity, that is easily enough to power almost any gear you've got -- and fast. A 15-inch MacBook Pro can handle 87W of input power, and the SuperTank battery pack can output that and then some. You can charge a 15-inch MacBook Pro and a 13-inch MacBook Pro simultaneously, at 9W shy of full speed. Incredibly impressive to see from a battery pack. 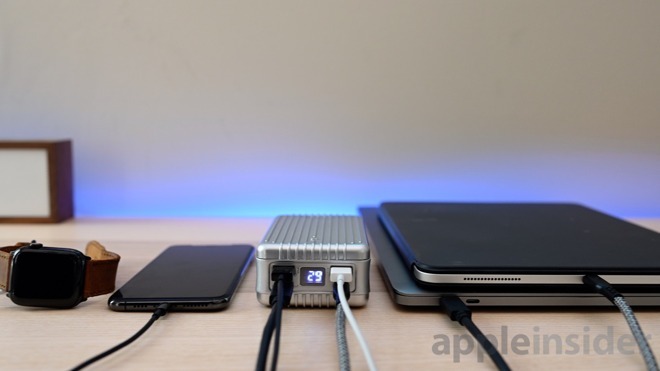 In a single person workflow, this battery is able to power our MacBook Pro, iPad Pro, Nikon Z 7, and iPhone all exceptionally quick. The usual problem with batteries of this size is the several hours it takes to charge them up. SuperTank, with its 100W input, is actually able to completely recharge in only an hour. This ability can't be overstated. 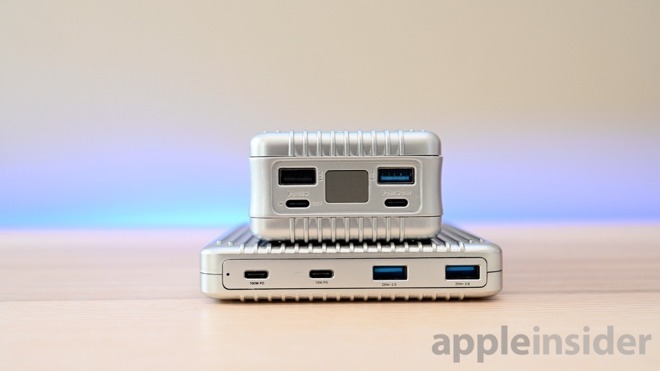 Since the 100W USB-C port acts as the input and the output, attention has to be paid when connected to something like a MacBook Pro. Sometimes, you want the battery to charge your Mac. Other times, you want the Mac to charge the battery. A simple press and hold of the button allows the battery to reverse course, whichever way you choose. A commonality among batteries, especially large ones, is the inability to power up small pieces of gear. Think headphones or watches. It isn't every battery, but if you have ever plugged in a pair of earbuds into a battery pack only to have it continuously stop charging, you understand the issue. Those large batteries have a minimum current requirement that these devices just don't meet. Zendure solves this by way of X-Charge low power mode. Double press the button and an "X" will show on the display, letting you know you've entered low power mode. Now low-consumption devices, especially wearables can charge without issue. We mentioned earlier that this battery, thanks to the 100W input, can completely recharge in only an hour. To make that happen, you need a power supply fast enough. If you've got an 87W MacBook Pro power adapter lying around, that will do well enough. However, if you want to charge as quickly as possible, you need a 100W power brick. 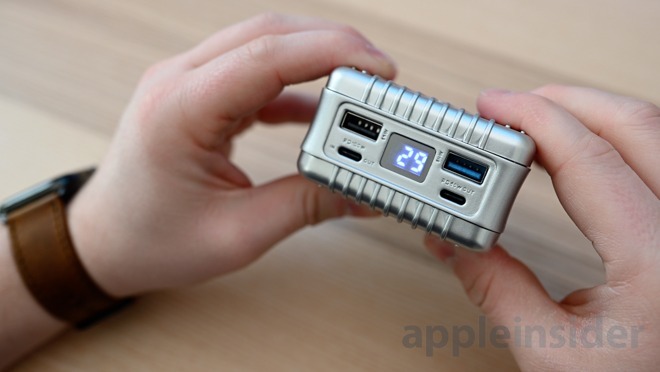 The SuperPort 4 is a four-port multi-charger with two USB-C PD ports and two USB-A ports. Its total combined power output is 136W, which means you can charge SuperTank at full speed and still have enough left over for a 12-inch MacBook. It employs a similar look and feel to the SuperTank, with the same color schemes and textures. When you look at other multi-chargers, like the Satechi model we recently raved about, it looks a bit weak in comparison. It was limited to 75W of power, and it is stacked vertically. SuperPort is horizontal which is a much more natural position for accessing ports. There is a 100W USB-C port, an 18W USB-C port, and two USB-A ports. Unfortunately, it doesn't have the second 60W port we saw with the SuperTank. For most people at home or work, they won't necessarily need that from a power adapter though. There are a lot of little things we love about the SuperTank and the SuperPort. For instance, UPS mode. PowerTank allows for seamless passthrough power which first charges your gear before the battery, but if the power is ever removed from the battery, your equipment will move to the battery's power without missing a beat. Essentially, like a universal power supply. We also are thrilled to see so much work going into the safety aspect of both the SuperPort and SuperTank. On SuperTank, there are nine layers of protection. Overcharge protection, over discharge protection, dual temperature protection, short-circuit protection, output overpower protection, output overcurrent protection, input overcurrent protection, input overvoltage protection, and MCU reset. This covers pretty much any concern one could have about a battery. That includes dual-temperature sensors so if one would ever fail, a backup is ready to take over. SuperPort has a plethora of safety features of its own. Automatic current matching, output overvoltage protection, output short-circuit protection, output overcurrent protection, input short-circuit protection, input overvoltage protection, input overcurrent protection, and temperature protection are all baked in. Zendure is also not using off-the-shelf lithium-ion batteries that are most common. Instead, they are using power cells usually reserved for electric vehicles. They are a bit more compact and have a longer life than Li-ion. They also hold their charge incredibly well. Once charged, it will retain 95-percent of its power after six months idle. That helps make sure the battery is always ready to go when you need it. If you have SuperPort and SuperTank, they can charge one another. You need to use the appropriate cable though. 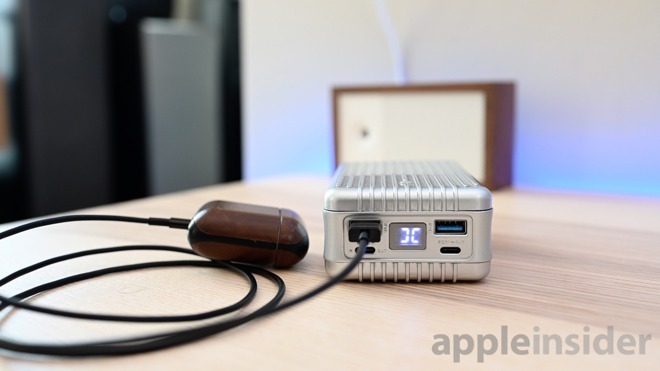 Even the one included with your Mac won't handle the full 100W of power. Nomad has an excellent rugged 100W USB-C cable, but Zendure is including a free SuperCord as part of a stretch goal on its preorder campaign. One thing we'd like to see is the addition of more USB-C ports. If we want to go all in on USB-C -- and we do -- we need to replace USB-A ports with USB-C. 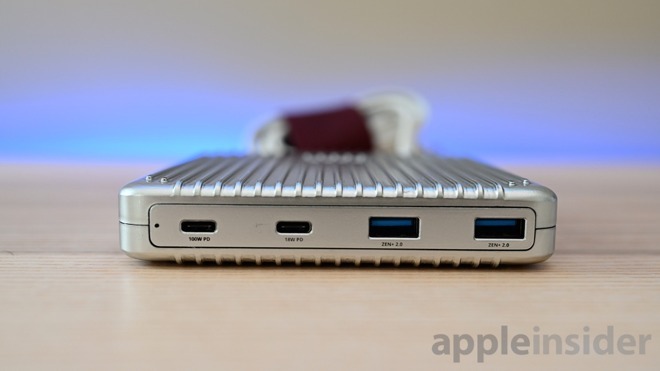 When AppleInsider reached out to Zendure about this, they were on board and have since made a four-USB type-C version of the SuperTank a stretch goal. 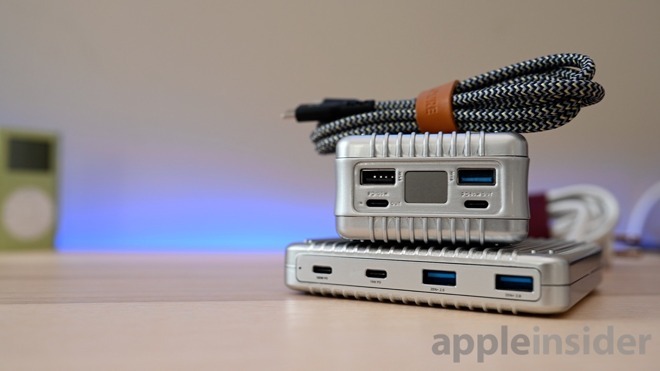 That way your Mac, iPad, iPhone, and Apple Watch can all charge over USB-C.
Another, albeit minor, pain point for us was the lengthy cable of the SuperPort 4. No cable tie was included, which made traveling with it difficult. We opted to attach our own Twelve South CableSnap to keep the cord in place, but we've preferred one included out of the gate. Zendure -- a Kickstarter veteran -- has turned once more to crowdfunding for preorders of the SuperTank and SuperPort 4. Early birds can grab the SuperPort 4 for only $59 or the SuperTank for $89 before the prices start to increase. Both products are slated to enter production soon and start shipping to backers by May. 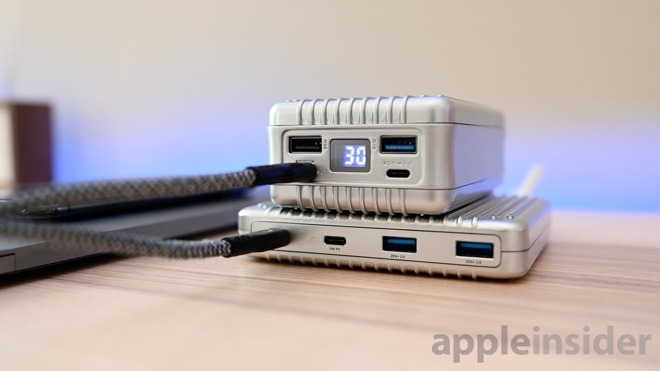 If you don't need the speed or versatility of the dual USB-C ports, the existing A8PD is currently on Amazon (and $20 off) as well as many other Zendure chargers and batteries which you don't have to wait till May to get your hands on. Even though Zendure is a Kickstarter pro and has used the platform to successfully bring products to market in the past, crowdfunding projects are never guaranteed. 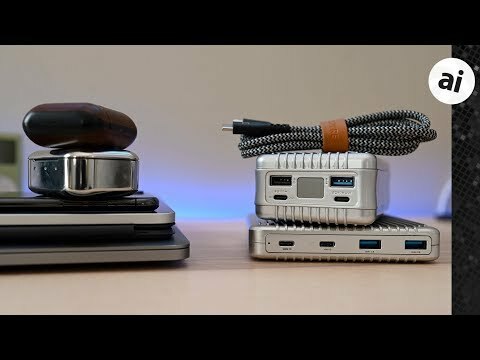 Zendure has history, and completed products exist -- as evidenced by this review. Great looking product. Thanks for the preview! Question: Does super tank support trickle charging? Could it charger from a regular 5v usb outlet (or more to the point, could it be charged from a low wattage portable solar panel). ...If the answer is yes, take my money now!